Shrouded in legend and entangled in a lawsuit, the 14-pound (6.35-kilogram) gem known as the Pearl of Allah moved a step closer to an eventual sale after a key court ruling. The Colorado Court of Appeals on Thursday upheld a $32.4 million (EUR23.89 million) wrongful death judgment against the estate of Colorado Springs bar owner Joe Bonicelli, who had bought a share of the pearl. The ruling clears the way for a probate court to settle Bonicelli's affairs. Three adult children of Bonicelli's first marriage, who filed the lawsuit, have said they want the pearl sold to pay the judgment. Appraisers have valued the pearl at up to $60 million (EUR44.24 million), said Richard Tegtmeier, a lawyer representing the three. After Bonicelli died in 1998, the estate and part-ownership of the pearl went to his daughter by his second marriage. The children from the first marriage filed the suit when they learned after their father died that he was implicated in the shooting death of their mother, Eloise Bonicelli. In 2005, a jury awarded them the $32.4 million (EUR23.89 million). Nicolina Angeli Bonicelli, the daughter of Joe Bonicelli's second marriage, appealed the award, saying it was too high and the lawsuit was filed too late, but the state appeals court disagreed. In a statement, Nicolina Bonicelli said she was disappointed and that "the system has let me and the citizens down." She declined to say whether she would appeal to the state Supreme Court. Tegtmeier called the ruling "very good news." His clients, Michael Bonicelli, Gwendolyn Garris and Donna Fuller, have said they want to establish a foundation in their mother's name to benefit abused children. 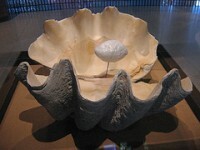 Tegtmeier said the pearl is stored in a Colorado Springs bank. He said he would file a motion to have it pearl examined and reappraised. Eloise Bonicelli was shot by a suspected intruder in her Colorado Springs home in 1975. After Joe Bonicelli's death, police said they determined that his wife's slaying was a contract killing done at his behest. A Colorado Springs barber was convicted of killing Bonicelli's wife and the wife of another man whom Bonicelli had introduced to the barber. The origin of the grayish, football-sized lump of pearl is surrounded by legend and myth. One story says it was an amulet of Chinese philosopher Lao-Tzu. Another says it was lost in a shipwreck centuries ago, then found in 1934 off the Philippines by a diver who drowned when he reached into a huge clam to take it.